Hello everyone! I have a beautiful group of cards created by Karen to share with you this week but first I’d like to remind everyone that the Valentine’s deadline is December 31st and you can find other holiday deadline details in this post at the HomeFront Blog. Now onto Karen’s cards! This wonderful mix of card themes will inspire you no matter what theme you’re currently working on. Karen warns that her blog has been neglected and like many of us (myself included) is what I’d call an on again-off again blogger. You can find her at “Slightly Scrappy” and of course you can also leave her a comment here at the end of this post. Yes, I use a spare bedroom for my library/craft room. I love stamps by Papertrey Ink and Hero Arts. I’ve just discovered Studio Calico kits due to Sandy’s recommendation. 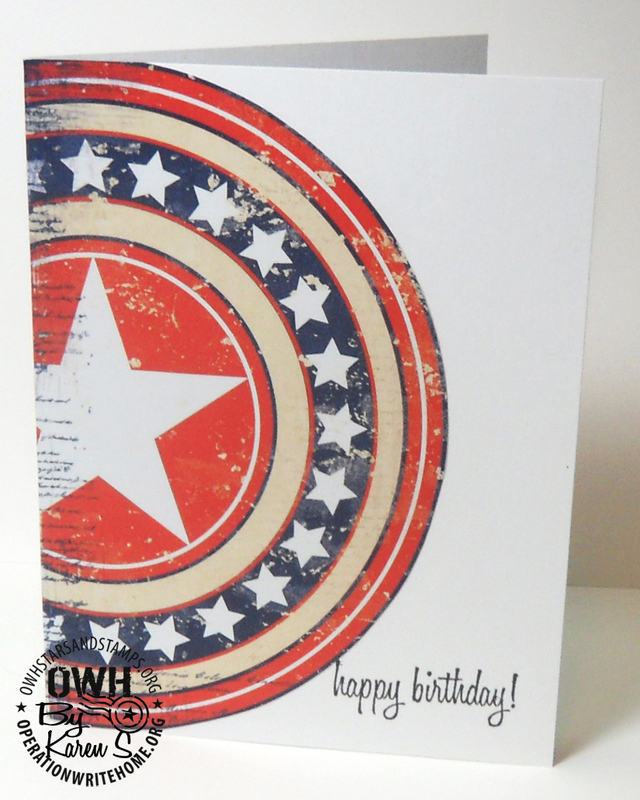 Jillibean Soup has a great to card kit club that has given me a lot of design inspiration. Not really, just pretty basic stamping and die cutting. Would love to have time for more coloring practice. Red is my favorite color. Goes great with our patriotic theme, too. I saw a magazine article and read about OWH on some crafty blogs. I like that such a small act provides a special way for our heroes to keep in touch with friends and family. Great cards…Very Crisp and clean! Love the herringbone one the best! Thanks for sharing!!! Really nice cards, Karen! The birthday stars/half circle is especially unique. Love the flower centers with a little thread to dress them up too. 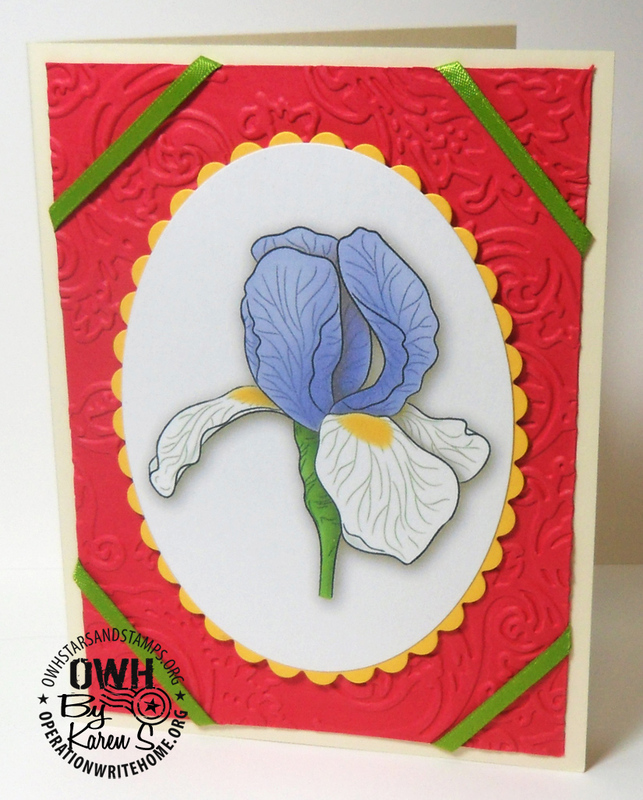 Karen – what beautiful cards! 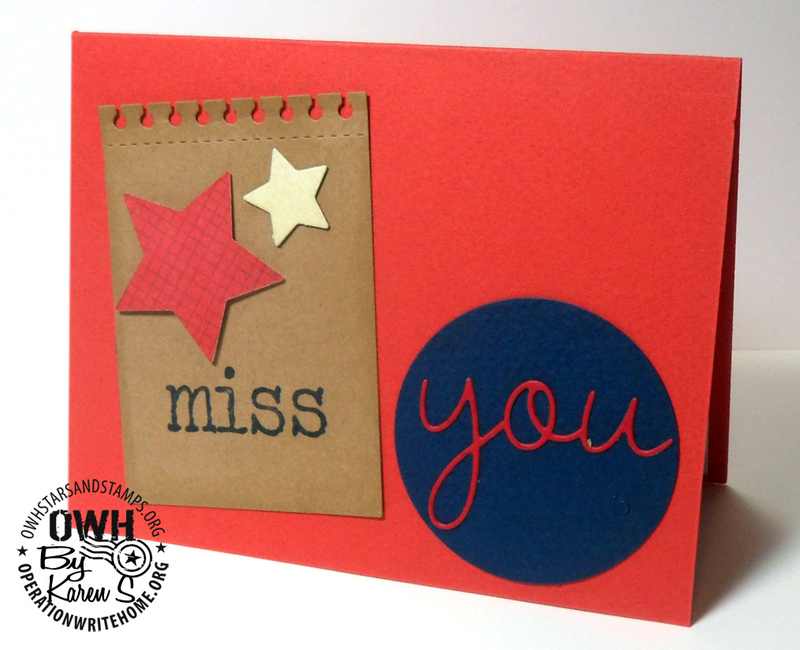 I particularly like the Thinking of You card with the black and beige tone – I really like howsubtle the paper is! Great Great job – thanks for sharing. These are all terrific cards Karen! I particularly like the patriotic birthday card (love how the the bold graphic circle falls over the edge) and how you made the blue base of the card form a frame on the miss you card and how you echoed the curves pof the flower petals in the pale pink background on the butterfly card. Lots of nice details and such a great clean and crisp style in every one. Thanks for letting me share you cards with everyone this week! Karen, your cards are wonderful! I really like the birthday card with that big circle graphic. Love the last card too – with the big sentiment. Thanks for sharing your cards with us! I just love your CAS cards! You have a great eye for coordinating your colors and laying these out. Thank you for sharing these! Karen, these cards are great!! I love CAS cards, I can see myself CASEing some of yours! Thank you for sharing!